The usage of various synonyms for woolgrease and its derivatives (such as lanolin and related products) is still slightly inconsistent. When people use term lanolin, they usually mean lanolin anhydrous (lat. adeps lanae) - a refined, pharmaceutical grade woolwax without any admixtures. This substance must be distinguished from Lanolin DAB, an expression used by former German pharmacopoeia for a mixture of lanolin anhydrous, water and paraffin oil. The latter one is also called Lanolinum. Nevertheless, Swiss pharmacopoeia (Ph. Helv.) defines Lanolin as a mixture of lanolin anhydrous, water and olive oil. 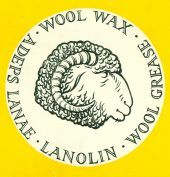 In technical fields, terms woolgrease and neutral woolgrease are widely used for lanolin. However, since lanolin does not contain glycerine, the basic ingredient of grease, these terms are chemically incorrect. Woolwax is a type wax rather than a grease. This woolgrease is recovered from the wool scouring process and is usually not further refined. As such, it must not be mistaken with wool fat, a term used in the European Pharmacopoeia (Ph. Eur.) for pharmaceutical (i.e. refined) Lanolin.